Nowadays the PCs are designed in a way that their cooling solutions take out all of the hot air from inside to the back of the computer case. All of the heat generated by the processor and the video card is usually moved from the insides of the PC case by fans located at the back side of the case and then above or below them is the power supply that also brings out some of the hot air, though often it is mostly giving out heat that is generated by the PSU itself. There are of course some computer cases that have places for a lot of cooling fans and the user has the ability to change the way the cooling works by changing which fans take cold air from outside and which bring hot air to the outside. In the specific case we have here the computer case has two exhaust fans on the back and on top of them is located the power supply. 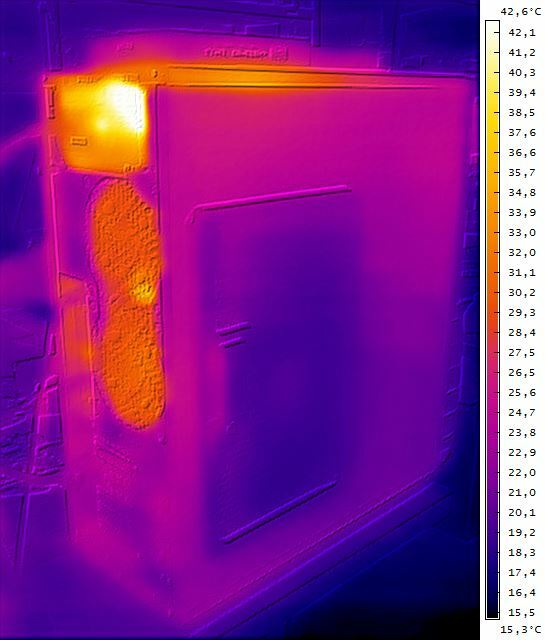 As you can see on the thermal image some of the components inside the PSU are apparently getting quite hot when the computer is under heavy load. 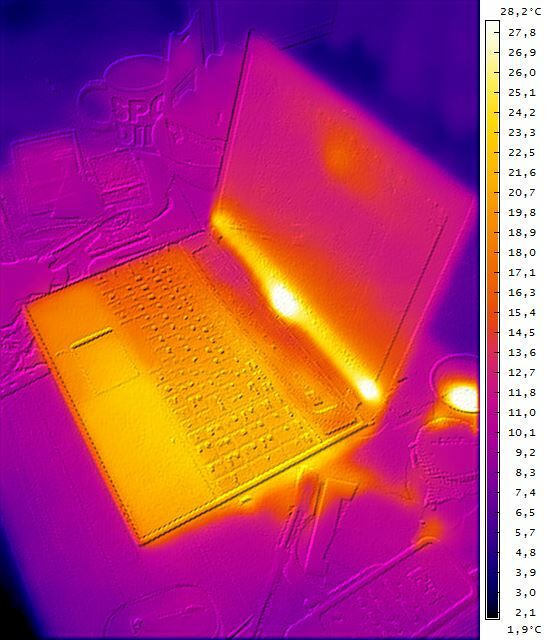 Have you wondered how a laptop looks like when you take a thermal image with the computer working normally and not loaded to the maximum, well you don’t need to anymore. As you can see from the thermal image the chassis of the laptop is having a pretty evenly spread temperature, meaning that the cooling is working well and is well balanced. If there is some hotter area this is usually where the processor and the video card are located as well as the exhaust of the laptop cooling that blows out hot air is. Do note that the lower part of the screen of the laptop has a higher temperature than the upper one, this is due to the fact that at the bottom of the display usually the manufacturers put some electronics that is responsible for powering up the backlight of the screen. In the future we are going to be looking up at some other notebooks, taking thermal images with different usage scenarios, so that you can see the difference. 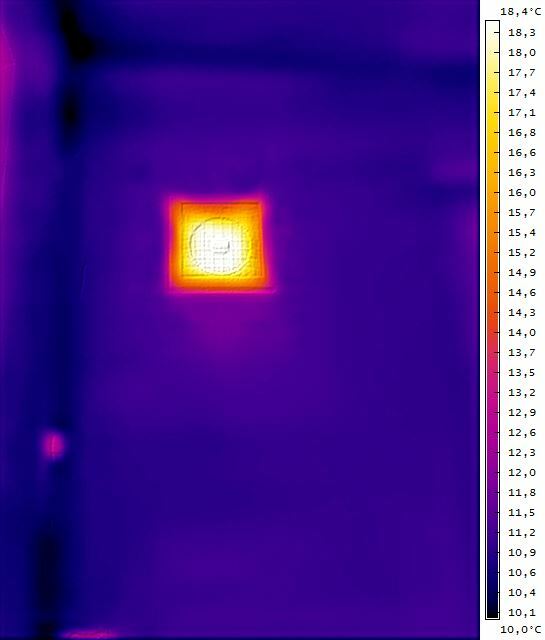 Here is an example of a thermal image of exhaust ventilation that can be misleading only judging things based on the visual information with false color without taking a look at the temperature representation of the colors. On the image it may seem that the temperature of the exhaust ventilation and cooling fan is much higher than that of the surrounding environment including the cold wall. In fact however the temperature of the exhaust vent is just a few degrees Celsius more than that of the wall, something that happens due to the fact that the motor of the fan in the exhaust fan gets hotter while operating as well as due to the hotter air going out through the vent. The conclusion, when looking at a thermal image do not get a false impression by just looking at the false colors used for temperature representation – look as what values does the colors represent and what is the minimum and maximum temperature value of the temperature range represented on the image.